Our team, led by WildCRU’s Dr Cedric Tan, supported by our ex-Panther, Daniel Rocha, respectively from Singapore and Brazil, coordinated a remarkable collaboration that had deployed over 900 camera traps spread out across 8 sites in Peninsula Malaysia. The project was conceived because we were conducting fieldwork in the remote forest of Ulu Muda, close to the northern border of Peninsular Malaysia with Thailand. As we struggled in this very tough landscape, much beset by leeches and rain, to gather camera-trap images of clouded leopards, we realised that other teams had done this before albeit in other parts of the peninsula and motivated by the quest for tigers – from which clouded leopards were an incidental by-catch. The more we thought about it, the more we wondered what a treasure trove of data on clouded leopards resided in those tiger portfolios. With this in mind we built a marvellous collaboration with local non-government organisations, namely RIMBA, WWF, MEME (Management and Ecology of Malaysian Elephants), MyCAT (Malaysian Conservation Alliance for Tigers) and TEAM (Tropical Ecology Assessment & Monitoring Network). 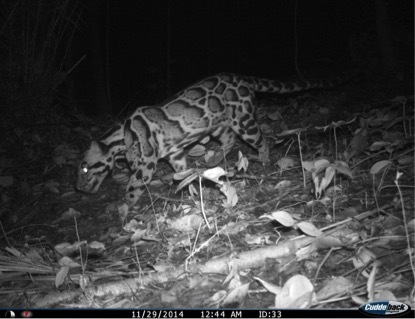 Combining all our data sets, we examined which environmental factors affect clouded leopard habitat use across Peninsular Malaysia using what ended up as the largest dataset ever analysed for the mainland clouded leopard. Our results show that clouded leopard preferred to use habitats further away from water bodies, on higher elevation and higher forest cover. 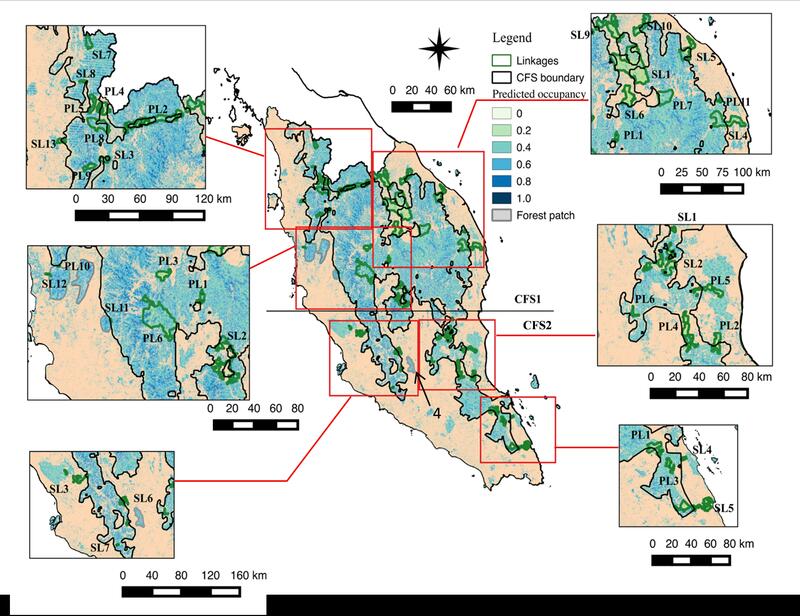 Using these findings, we predicted the habitat suitability of all forest patches in Peninsular Malaysia as well as of proposed ecological linkages. We show that 26 of the linkages were less than 50% covered by forest and that 23 out of 37 of the linkages had less-than-average probability of use by the clouded leopard. We have also identified 4 forest patches not within the current Central Forest Spine masterplan that were highly suitable for the clouded leopard. Our findings are important for land use planning and management to support populations of clouded leopard. Crucially, we have identified suitable habitats that could be incorporated into the protective network of forests and more can be done to prevent further deforestation in the planned ecological linkages. Below is our video on this research from Laurie Hedges.